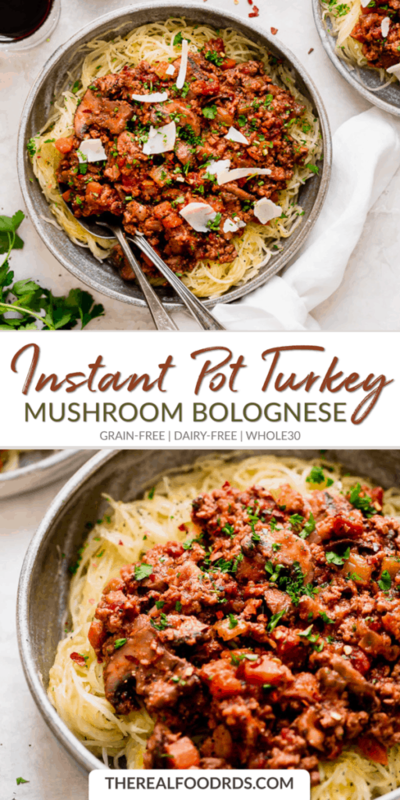 If only every weeknight dinner was as simple and satisfying as this Instant Pot Turkey Mushroom Bolognese! From ingredients to dinner in just 35 minutes. 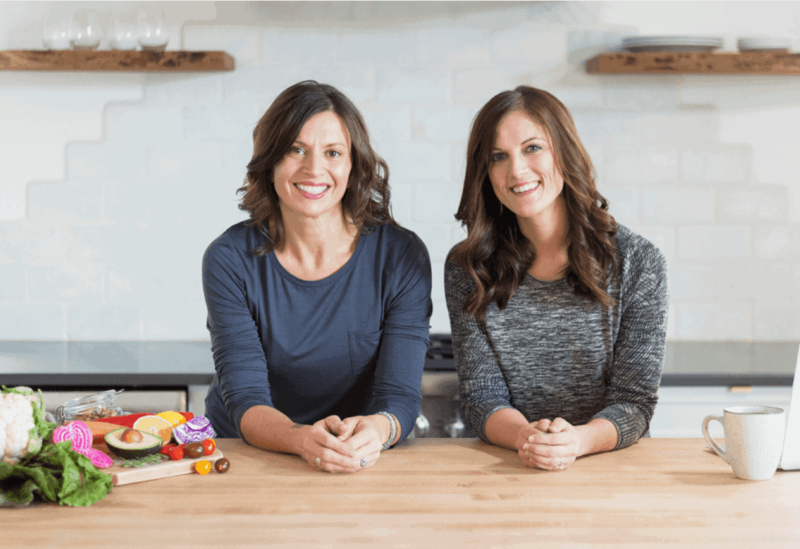 Thanks to the magic of the Instant Pot…you DO own an Instant Pot, right?! 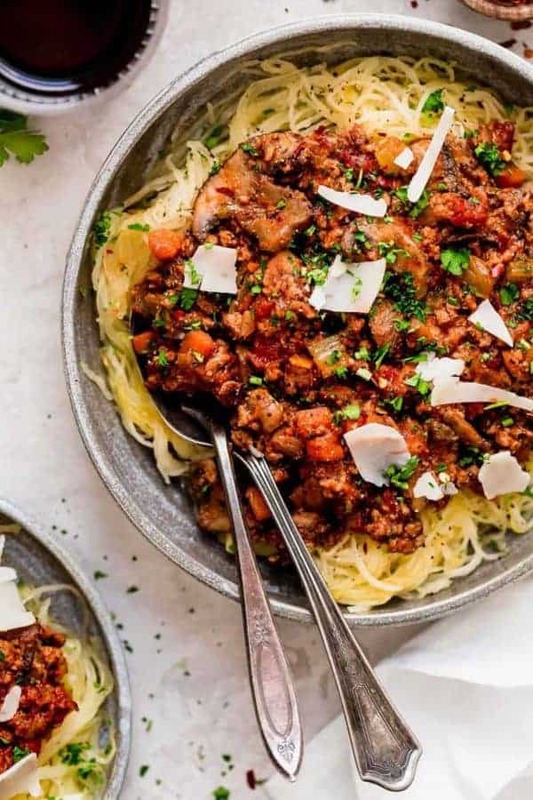 If not, now is the time to get on board because we’re on the fast track to flavor town with this Instant Pot Turkey Mushroom Bolognese (and all of these quick and delicious recipes). 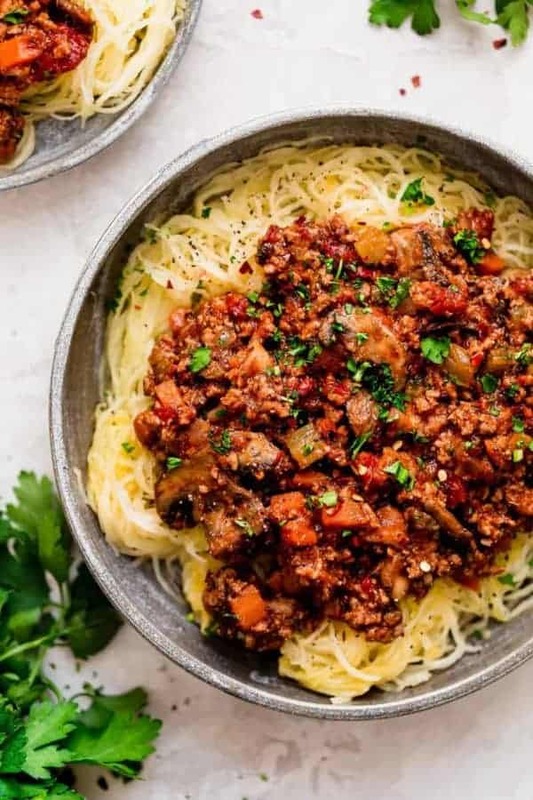 No kidding, in less than 35 minutes you can have a pot full of hearty, satisfying meat sauce pumped up with extra veggies and bacon. 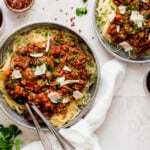 It just begs to be served over a bed of spaghetti squash or zucchini noodles (if you’re looking to keep it Whole30-friendly) or your favorite gluten-free pasta. It’s totally up to you and would even be delicious stuffed into a baked potato or sweet potato or over a pile of mashed potatoes. Oh, the options are limitless here! Freezer-friendly comfort food is the best food. Nothing beats healthy comfort food other than freezer-friendly healthy comfort food. 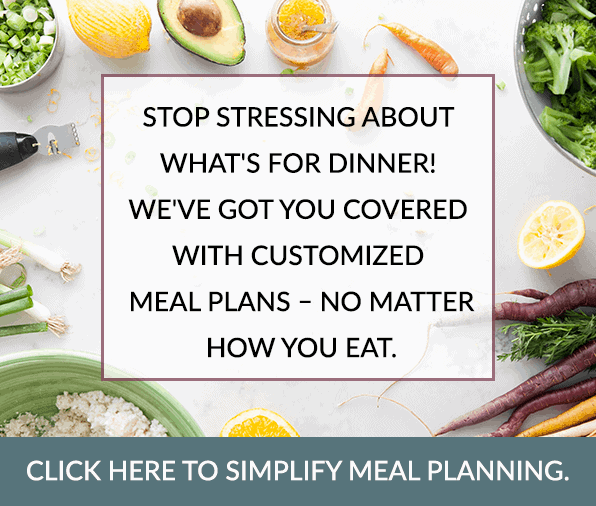 What’s more glorious than opening your freezer to find that you have some easy reheat-and-eat options waiting for you? Nothing, I’ll tell you. 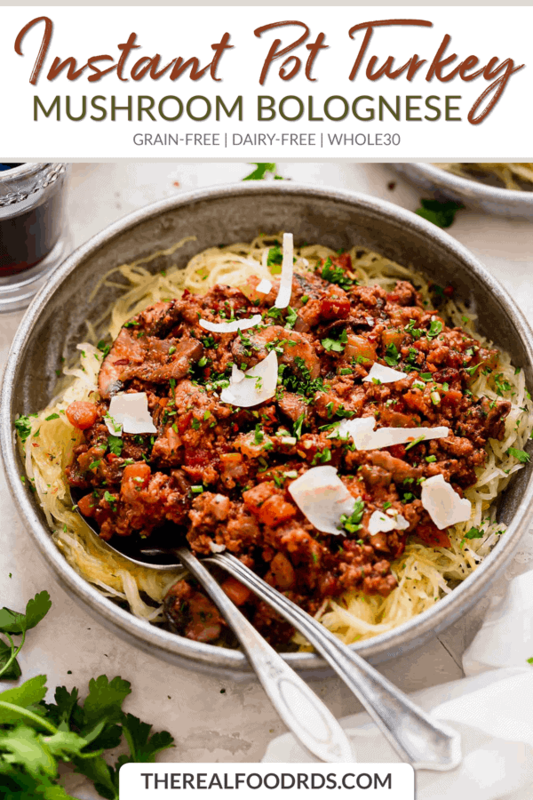 And this Instant Pot Turkey Mushroom Bolognese is the perfect dish to stash away in the freezer for those days when you just can’t muster the energy or find the time to cook a good meal. You can freeze it in one big container or divide it into 4 or 5 smaller containers (like these small glass bowls with lids) so it’s ready to go when you are. Just thaw (preferably in the fridge overnight), reheat and eat. Rich and saucy, that’s how we like our meals. It’s no secret that I’m crazy about warm, comforting foods. I’ll take a bowl of soup or chili or a plate of roast chicken and veggies over a salad any day. And honestly, the saucier the better. I’m a sauce girl. A condiment queen, if you will. 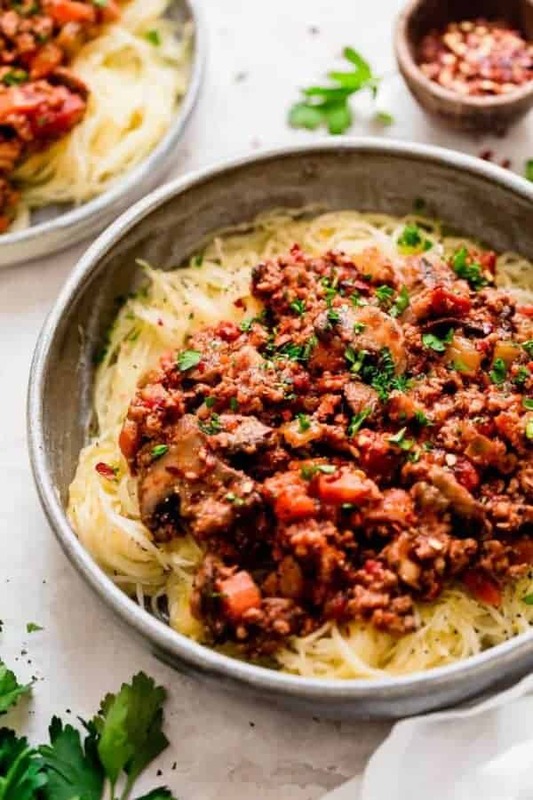 And although this Instant Pot Turkey Mushroom Bolognese is plenty rich and saucy, it definitely doesn’t need any condiments. Unless of course, you count big fat shavings of salty, savory parmesan cheese and a hefty sprinkle of bright and peppery parsley a condiment (it’s actually more of a garnish, but you get where I’m going here) – then by all means go crazy if you’re not doing a Whole30 or don’t need this dish to be dairy-free because cheese. That’s pretty much a standalone statement and doesn’t really need any explaining, but I will say that if you’re tempted to leave out the bacon, don’t. But if bacon just isn’t your thing then consider adding a pinch of smoked paprika to give it that little extra depth of flavor. To cheese or not to cheese? You already know where I stand on this, but if you’re looking to keep this dish Whole30-friendly or you can’t have dairy, then I get it. It’s worth saying though that a little cheese just takes this dish over. the. 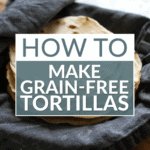 top so don’t forget to add it to your grocery list for the next time you head to the store. 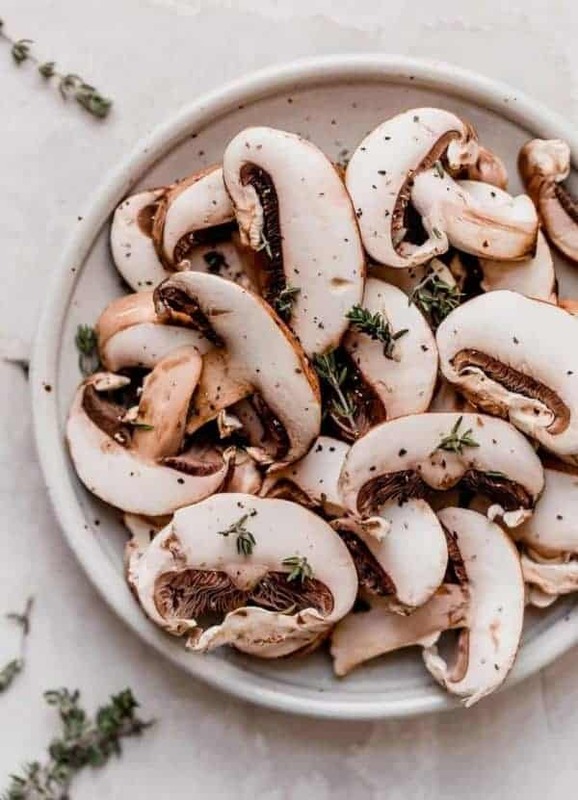 Can I make this in a slow cooker? Yes. 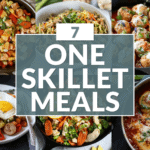 Follow recipe through Step 2 using a large skillet over medium-high heat (instead of the Sauté function of the Instant Pot). Add turkey mixture to slow cooker along with Italian seasoning, balsamic vinegar, diced tomatoes, and tomato paste. Cover and cook on LOW for 6-8 hours. Taste and season with salt and pepper before serving. Can I make this on the stovetop? Yes. Follow recipe through Step 3 using a large Dutch oven or pot with a tight-fitting lid over medium-high heat. Place lid on the pot, lower heat to medium-low and simmer sauce for 30 minutes before serving. Can I substitute ground beef, pork or bison? 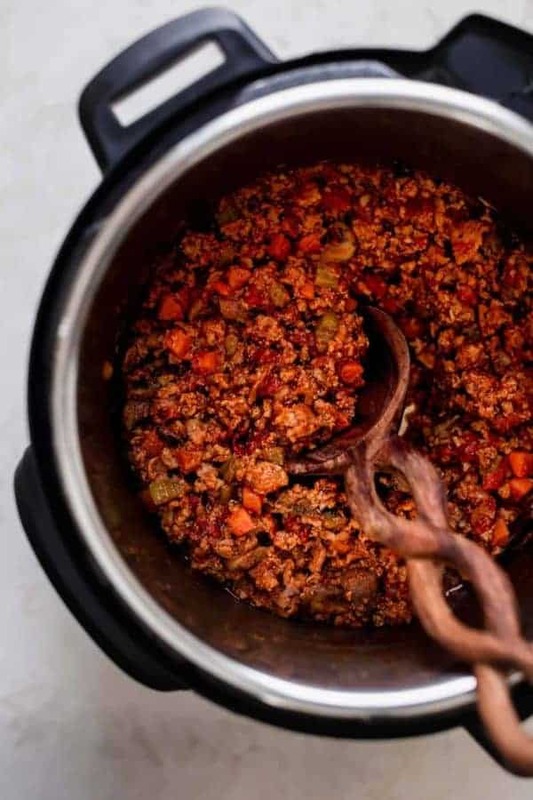 Yes, feel free to substitute your favorite ground meat in this recipe. What if I don’t have diced tomatoes? You can use crushed tomatoes. Do I have to use bacon? No, but the flavor is much better if you do. 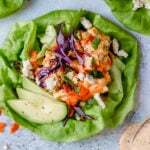 If you decide to leave it out, use 2 teaspoons of olive oil or avocado oil to sauté the veggies and turkey, and consider adding a pinch of smoked paprika with the Italian seasoning to enhance the flavor of the dish (and give it a bit of smokiness that you would have gotten from the bacon). 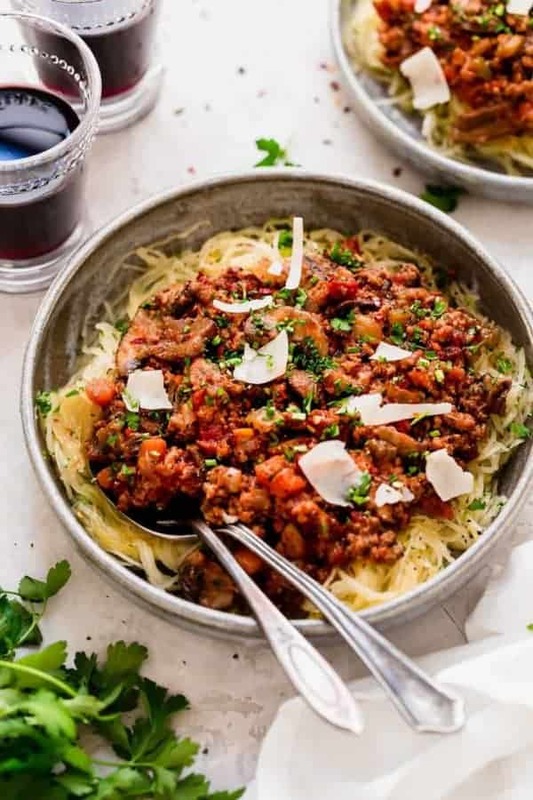 This Turkey Mushroom Bolognese is like a pumped-up version of meat sauce (aka extra veggies and a little bacon to give it a richer flavor without having to simmer it for hours). Select ‘Saute’ function on the Instant Pot. When the pot is hot, add bacon and cook 3-4 minutes or until bacon starts to get crispy and fat has rendered out. Add onion, carrots, celery, and mushrooms. Stir into fat in the bottom of the pan. Cook for 4-5 minutes or until the veggies start to soften. Add garlic and ground turkey and cook an additional 5 minutes or until turkey is almost cooked through. Add Italian seasoning, balsamic vinegar, diced tomatoes, tomato sauce, and salt. Stir to combine. Select ‘Cancel’ then lock the lid into place, flipping the vent valve to the ‘Sealing’ position. Cook for 11 minutes on ‘Manual’ or ‘High Pressure.’ Allow for 10 minutes of natural pressure release before flipping the vent value to ‘Venting’ and removing the lid when safe to do so. Stir, taste and seasoning with additional salt, black pepper, and red pepper (if using) to taste. Stir in fresh parsley and top with shredded parmesan cheese, if desired. What’s your favorite freezer-friendly comfort food? Share in the comments below! This sounds delicious! You mention Parmesan cheese in the text but know where in the ingredients or directions (#6?) do you say how much cheese, or parsley for that matter, to use. What amount do you recommend? Thank you! 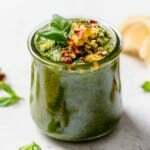 The recipe calls for 1/4 cup chopped fresh parsley and the parmesan cheese is listed as optional (and thus not included in the nutrition information) so you can use as much or a little as you like to suit your taste. Looks great! Did you use ground turkey breast or thighs? I used a ground turkey that was 93% lean so I’m guessing that was a blend of both dark and white meat. Either one will work though. This sounds DELISH!! 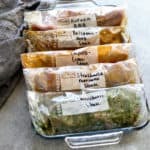 Is it possible for this recipe to be made in a slow cooker? If so, do you have a suggestion on how to modify the recipe? Thanks in advance!! 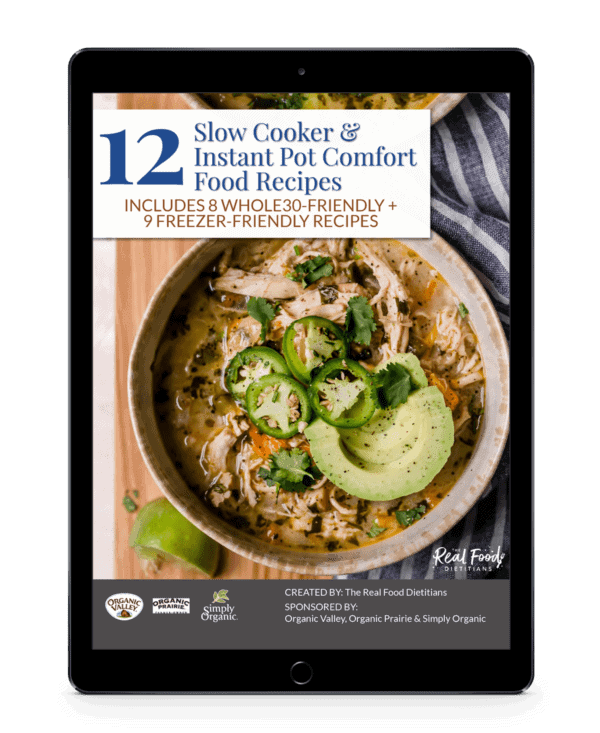 Follow recipe through Step 2 using a large skillet over medium-high heat (instead of the Sauté function of the Instant Pot). Add turkey mixture to slow cooker along with Italian seasoning, balsamic vinegar, diced tomatoes, and tomato paste. Cover and cook on LOW for 6-8 hours. Taste and season with salt and pepper before serving. 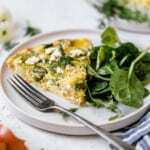 I want to double the recipe–do I need to change the time it’s cooked? Thanks!